Inspired by your risotto posting a few weeks ago I decided to make risotto a couple of days ago one Sunday evening that A and I were watching some TV and organizing the house. Now I had made risotto quite a few times before this one but never this way that I am about to tell you. A good family friend of ours has family from Italy, so all my attempts at making Italian food have been after learning from her. I should set up another ‘class’ with her because she is just a phenomenal cook, and her daughter is even better! So she gave me a risotto recipe that I have been following for quite some time now. This time though, I combined two recipes together into one. I also have never used truffle oil or saffron and my risottos are always delicious. 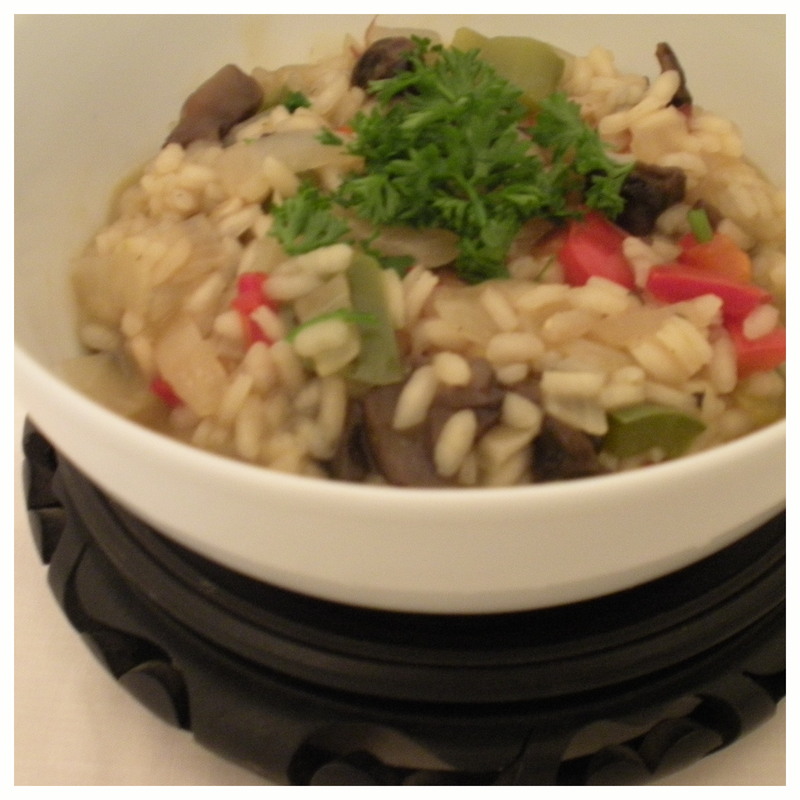 The risotto tricolore is a combination of my friend’s recipe together with a recipe from the New York Times – Red Pepper Risotto.The one thing I have never been able to accomplish is making risotto like you eat in restaurants. For some reason, the risotto they make at restaurants is almost like soup, like a creamy soup and I have not been able to get to that point. Practice makes perfect right? So I think that risotto is pretty simple. The difficult part is that you cannot just put it in the pot to cook and come back 20 minutes later to see if it is done. Risotto is an active food – meaning you have to be active and constantly interacting with it in order for it to come out right. 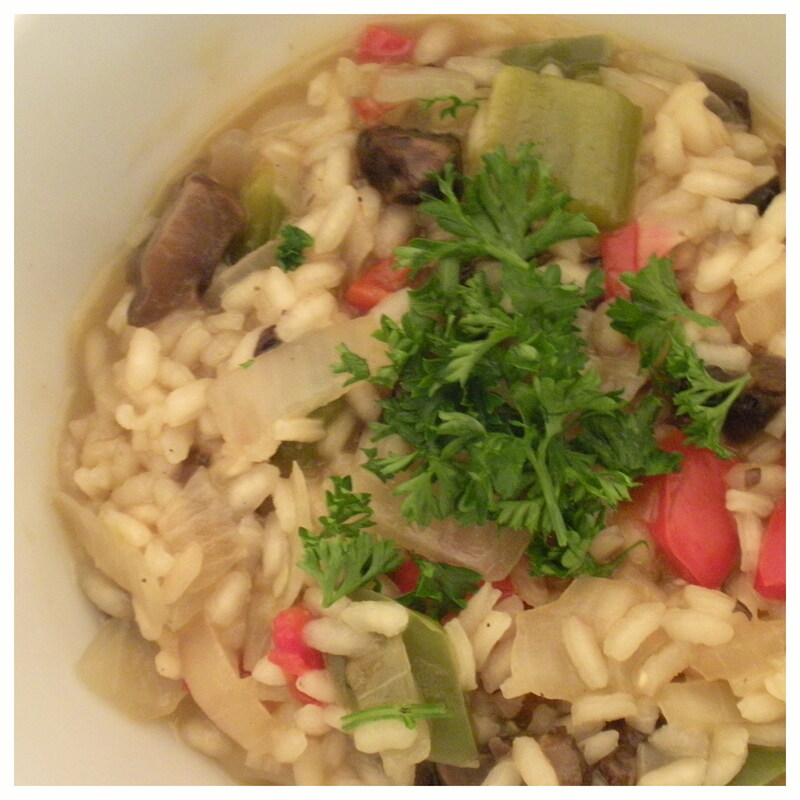 Risotto should also always be eaten fresh, even though leftovers are not bad at all. Cook the mushrooms and peppers in a pan with oil, salt, and pepper. While the vegetables are cooking, place the oil with the onion and garlic in a large pot and cook until the onion is translucent and in a separate pot bring the stock to a simmer. I usually boil water and then add vegetable stock powder, about 1 Tbs. Add 2 cups of rice to the large cup and cook constantly mixing. Stir in the wine and cook over medium heat, stirring constantly. The wine should bubble, but not too quickly — you want some of the flavor to cook into the rice. When the wine has almost evaporated, stir in about a cup of the stock, just enough to cover the rice. Cook, stirring often, until the stock is just about absorbed. Add the vegetables into the mixture together with about 1/2 cup of the broth and continue to stir until the stock is absorbed. Add another ladleful or two of the stock and continue to cook in this fashion, not too fast and not too slowly, stirring often and adding more stock when the rice is almost dry. Continue for 25 minutes, until the rice is cooked through but still a little chewy. Taste and adjust seasoning. When the rice is cooked through, add a generous amount of freshly ground pepper, and stir in another half cup of stock, the Parmesan and the herbs. Remove from the heat. 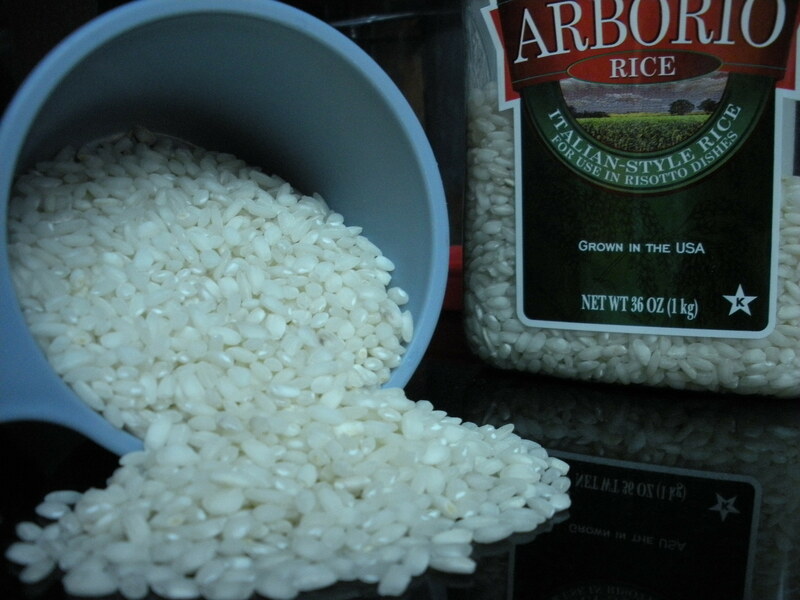 The rice should be creamy; if it isn’t, add a little more stock. Stir once, taste and adjust seasonings, and serve. *If you want to prepare in advance, the NYT article suggests cooking it halfway through step 4, about 10 to 15 minutes, then spreading the rice out in the pan or on a baking sheet. Reheat and proceed with the recipe shortly before serving. *You can use any types of mushrooms and even combine a few types. Frozen peas also make for good risotto. The pictures are not so good this time…. they were taken at the wrong time of day…. 9PM! This week there will not be that much cooking as Passover starts tonight. I will be making a dessert for my mom’s Seder which is tomorrow night. Not a boxed cake that you buy at the supermarket. I already did one of those for my grandma and it turned out terrible. No need to fear Risotto! Sorry to hear your kitchen week has been less than optimal, “Che peccato!” At least you got to enjoy some family time with your sister-in-law! The book sounds very interesting, and might just be the next one on my reading list. Right now, I am reading a book called “How I learned to cook“, actually I have been reading it for a while, but is not really the kind of book that you need to read the whole way through at once. It’s a collection of stories from the most renowned chefs worldwide, about how they learned to cook. It is really interesting, and actually links quite well with the idea of the outliers. None of them were ever awarded their Michelin stars or numerous accolades without failing miserably or really going through tough times. Fortunately, in a much less dramatic way, both you and I can afford to make our mistakes and laugh about them in our blog, without worrying about Food and Wine’s Review of our food… yet! For now, I am happy to be learning more about eating and cooking! So, thinking about what to make next, I realized there was a huge hole in my culinary repertoire… I have never made risotto in my life. Never. Many many people have been bragging about their unbeatable risotto, and I always regarded them with immense cooking respect. For some reason, risotto was one of those foods that I thought I would never be able to make, and reserved for eating only out at restaurants. 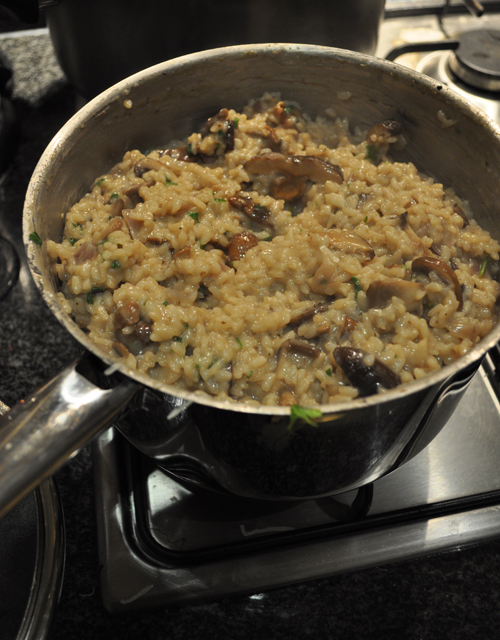 As it turns out, it is pretty easy, and you don’t need porcini mushrooms, truffles or truffle oil to make an amazing mushroom risotto… or Risotto ai Funghi! Place the stock and wine in a large saucepan, bring to a boil, then reduce the heat to low, cover, and keep at a low simmer. Meanwhile, heat the oil and butter in a large saucepan. Add the onion and garlic and cook over medium heat for 5 minutes or until soft and golden. Add the mushromms and cook for 5 minutes oruntil tender. Add the rice and stir until translucent. Stir in the Parmesan and chopped parsley and heat for 1 minute or until all the cheese is melted. Hope you have better luck in the kitchen next week! 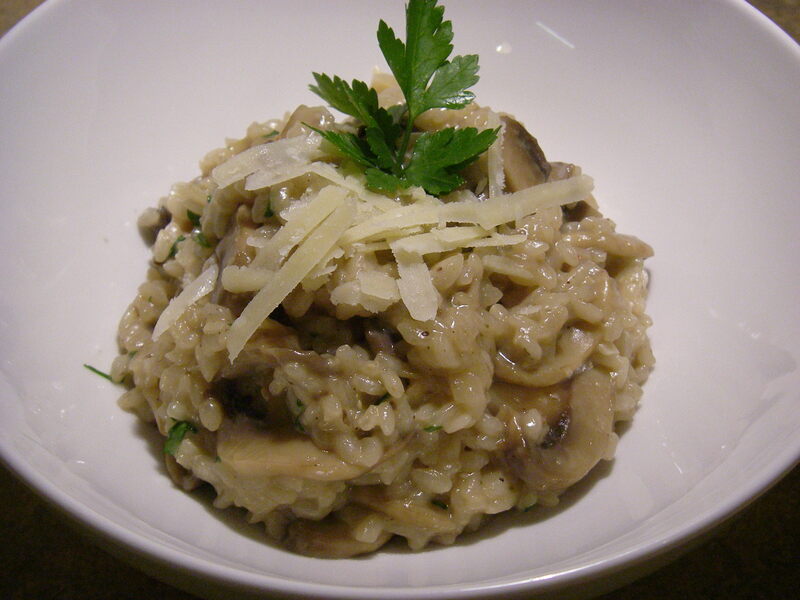 Mushroom Risotto: No need to fear Risotto! Meanwhile, heat the oil and butter in a large saucepan. Add the onion and garlic and cook over medium heat for 5 minutes or until soft and golden. Add the mushrooms and cook for 5 minutes or until tender. Add the rice and stir until translucent.